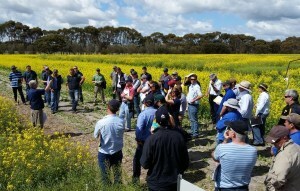 Pannell Discussions » Ideas in economics, environment, policy and more. ADOPT is the Adoption and Diffusion Outcome Prediction Tool. It is now available as an online version, replacing the spreadsheet that has over 1000 users. I’ve previous talked about how agricultural scientists, extension agents, policy makers and suppliers need to be able to predict how farmers will respond to a new practice or technology (PD203). How many farmers will adopt the new practice, and how quickly will they do so? This knowledge can influence research priorities, reserach funding decisions, the design and emphasis of extension campaigns, and the effectiveness of agricultural policies. 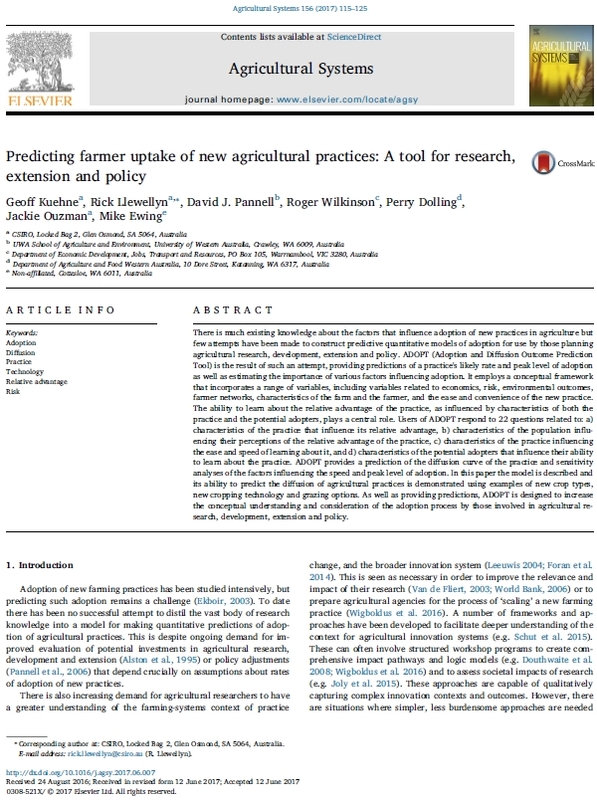 Although there is any amount of research exploring factors that influenced past adoption of novel practices by farmers, there has been very little effort to convert all that knowledge into a prediction tool. A team of us developed ADOPT to fill that gap. There have been over 1000 downloads of the spreadsheet tool we developed, which comes in two versions: for developed and developing countries. Now we have released an online version that superscedes the spreadsheet version for developed countries (we’re still working on the developing-country online version). It has a number of new features that make it even more useful and informative. If you’d like a to investigate it, head over to adopt.csiro.au. You’ll need to create an account, and then you can explore the tool for free. There is also an option to register for a full license, costing A$49, which gives you access to more results, a project report, and an unlimited number of assessments for one year. Meanwhile, our journal paper about ADOPT in Agricultural Systems continues to be in their top 10 most downloaded papers (as of 9 June 2018). There have been around 10,000 downloads of the paper since it went online in late 2017. Feel free to get one yourself – it’s free and doesn’t require a subscription. 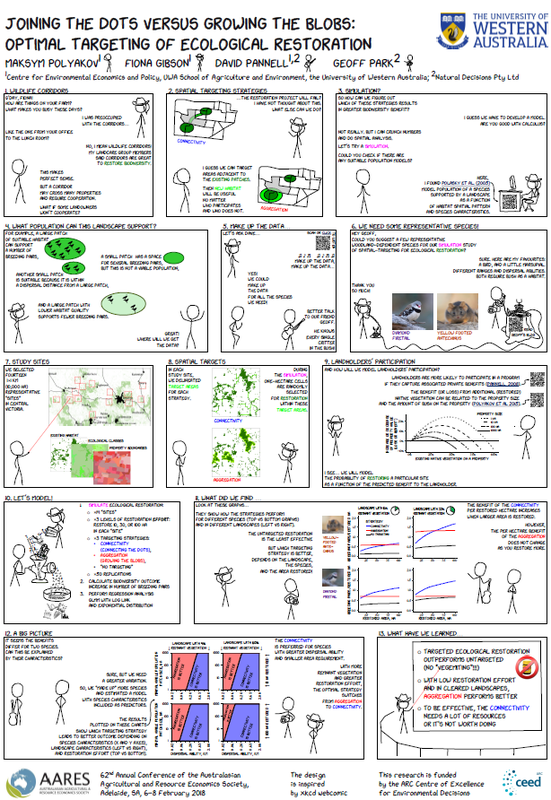 For the recent AARES conference in Adelaide, Maksym Polyakov did a wonderfully creative poster presenting our research on optimal targeting of ecological restoration. Not surprisingly, it won the prize for the best poster at the conference. The primary causes of biodiversity decline worldwide are habitat destruction, alteration and fragmentation resulting from human economic activities such as agriculture or property development. Public- and private-sector organizations allocate considerable resources to slow down biodiversity decline by developing conservation networks that preserve the remaining habitat. In this study we use simulation to compare several strategies to spatially target ecological restoration effort to create conservation networks, on private lands in a fragmented agricultural landscape. The evaluated targeting strategies are aggregation, connectivity and representativeness. The effectiveness of these targeting strategies is compared to the effectiveness of ecological restoration without targeting. We allow for heterogeneity of landowners’ willingness to participate in restoration projects and explicitly assume that that not all parcels within target areas will be restored. We model the probability of participation in restoration projects as a function of the private benefits of ecological restoration captured by the landowner. The results of the simulation are analyzed using regression analysis. Our results suggest that effectiveness of the targeting strategies depends on landscape characteristics (level of fragmentation) and species characteristics (habitat requirements and area of home range). On average, when uncertainty about whether landowners will participate is considered, for most analyzed species, the aggregation strategy outperforms the connectivity strategy with the representativeness strategy performing worst. This is contrary to the findings of previous studies and Government policy, that connectivity is the most effective strategy in fragmented landscapes. Accounting for the landowners’ behavior through a private benefits function improves the biodiversity outcome for most species.